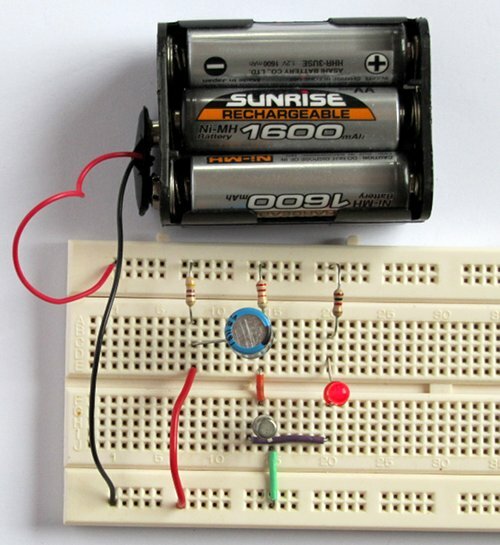 When the circuit is powered by a 9V battery, the LED switches on. 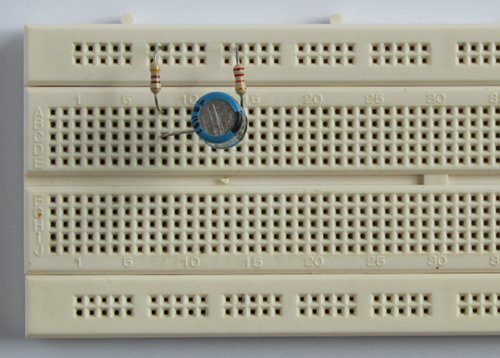 A switch (or link on the breadboard) is closed to start the timer causing the LED to switch off for a time period. After the time period is over, the LED will switch on again. The following video demonstrates the circuit. 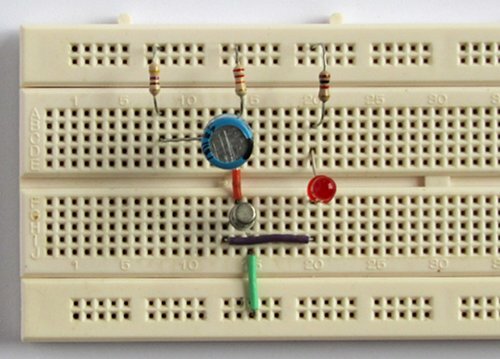 You will need to have completed tutorial one where you would have learned about breadboards, resistors, LEDs and circuit diagrams. 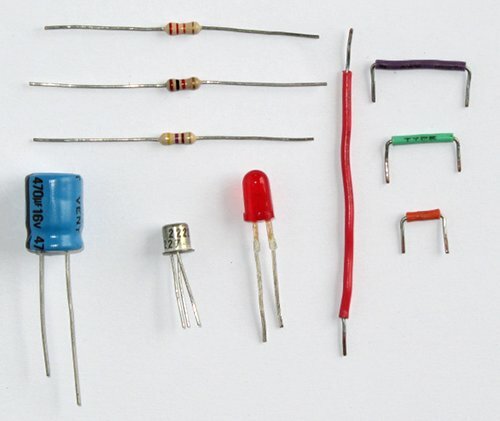 Learn about capacitors, transistors and switches before starting this tutorial. 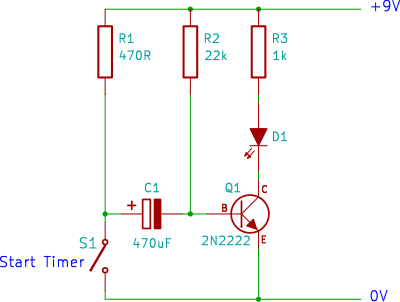 The circuit diagram for the simple transistor timer is shown below. The circuit diagram differs from the circuit diagram of tutorial 1 in that the components now have reference designators assigned to them. A reference designator is the R1, R2, R3, D1, C1 and Q1 labels that you see. Reference designators allow easy reference to the circuit's components - e.g. 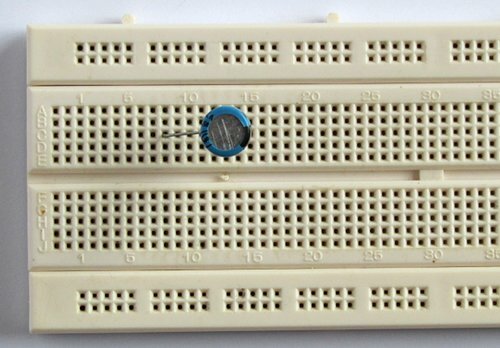 plug resistor R1 into the breadboard. They are also used to identify components on a circuit board. Circuit boards will typically have reference designators silk-screened on the board next to each component. In this way it is easy to find corresponding components on the circuit diagram and the circuit board. 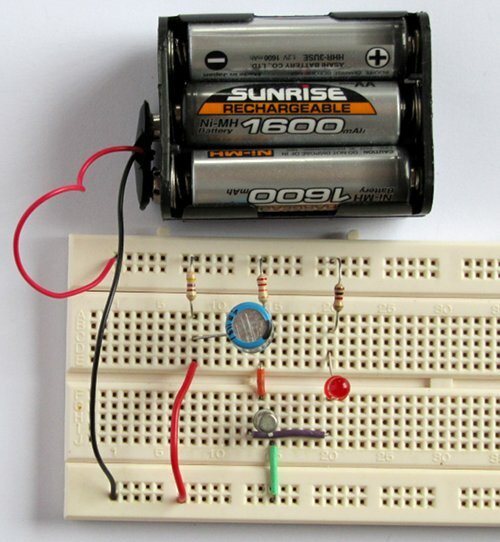 The circuit shows that it is to be powered by 9V. 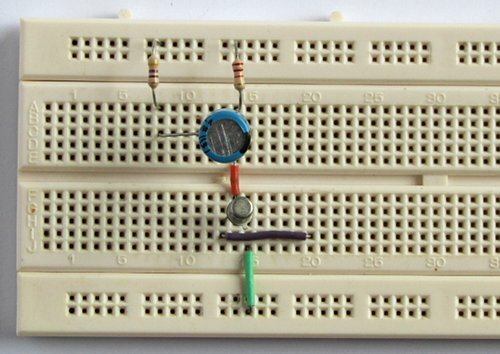 The positive terminal of the power supply (our 9V battery) must be connected to the +9V wire of the circuit diagram and the negative terminal of the power supply must be connected to the wire labelled 0V. The electrolytic capacitor must be connected the correct way around in the circuit - observe the capacitor's polarity. The polarity of the LED must also be observed - connect the LED the correct way around. 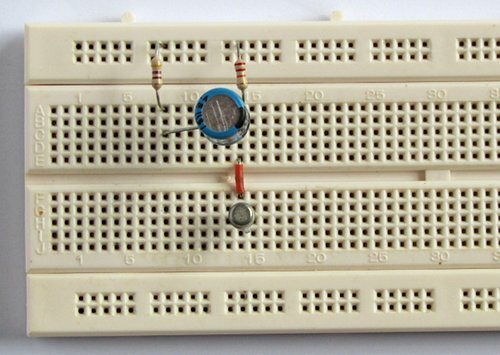 As you learned in tutorial 1, resistors can be connected with either lead to 9V. 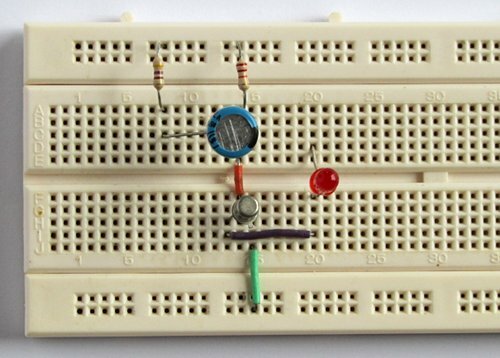 Be sure to place the correct value resistor in the correct place in the circuit. Notice that the value of R1 is 470R this is another way of writing 470Ω (or 470 ohms) and often appears in circuit diagrams where the software used to draw the circuit diagram does not have the capability to insert the ohm symbol. We do not need to use an actual switch in the circuit, but can instead use a wire link to act as a switch by plugging it into the breadboard to close the switch or unplugging it to open the switch. 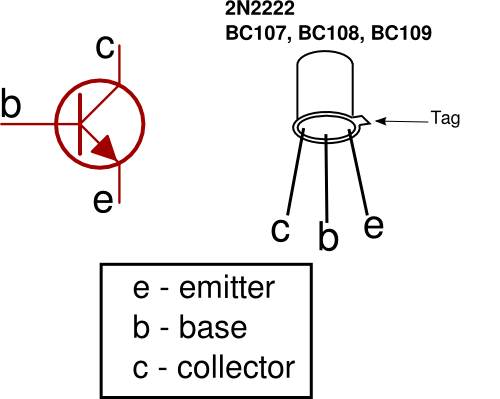 The transistor pinout needs to be observed - the collector (c), base (b) and emitter (e) of the physical transistor must be connected as shown in the circuit diagram. Take care not to connect any of the transistor pins to the wrong part of the circuit - e.g. 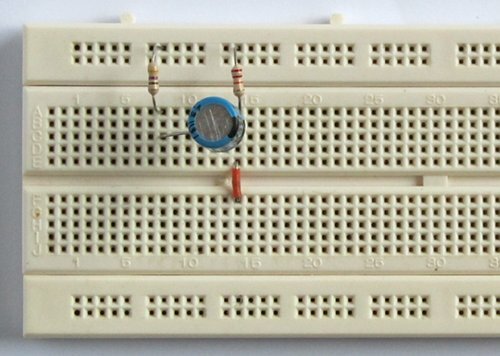 make sure that the collector of the transistor is connected to the LED and not the base or emitter. Bend the longer (positive) lead of the capacitor out to the left and plug it into the breadboard so that there are 5 empty holes (tie points) between the two capacitor leads. In the photo the negative lead of the capacitor is on the right. The negative lead is marked on the body of the capacitor. 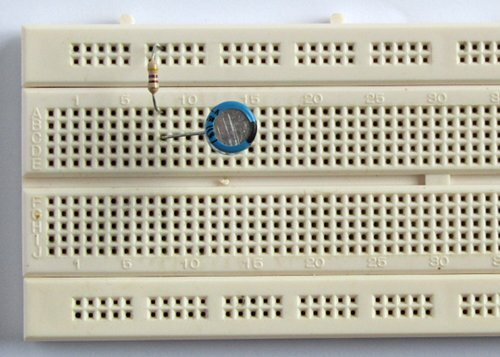 R1 connects to the positive lead of C1, so connect it to a tie point in the same conductive strip of the breadboard. The other lead of R1 connects to the top rail of the breadboard which will be where the positive lead of the battery connects. Connect R2 between the top rail and the negative terminal of C1. Connect a wire link from the negative terminal of C1 across the middle insulating channel. The transistor is connected so that the emitter is to the right (the lead nearest the metal tab). The base lead in the middle connects to the orange link in the photo. The collector is connected to the tie point to the left of the base. 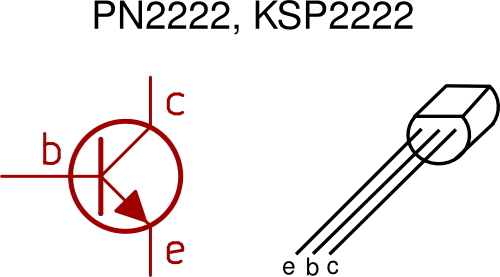 If using the PN2222 transistor, insert it with the flat face towards the capacitor. The emitter will then be on the right and the collector on the left. 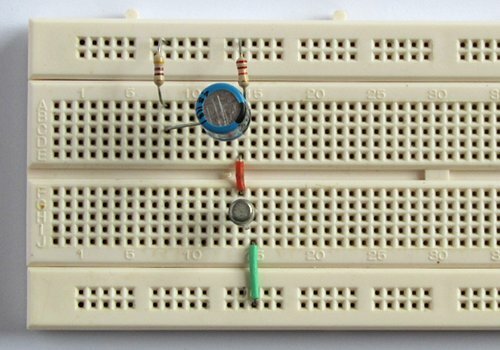 Connect the middle pin (base) of this transistor to the link that connects it to the negative lead of the capacitor. Use a wire link to connect the emitter at the right of the transistor to the bottom rail that will connect to the negative battery terminal and is marked as 0V in the circuit. Insert a link to connect the transistor collector to a tie point to the right - the purple link in the photo. The cathode (shorter lead) connects to the transistor collector through the link. R3 connects from the LED anode to the top rail. A link must be connected to where the positive lead of the capacitor and a lead from R1 connect - the red wire in the photo. To close the "switch", this link will be connected to the bottom rail - leave it open for now. When the battery is connected, the LED will switch on. 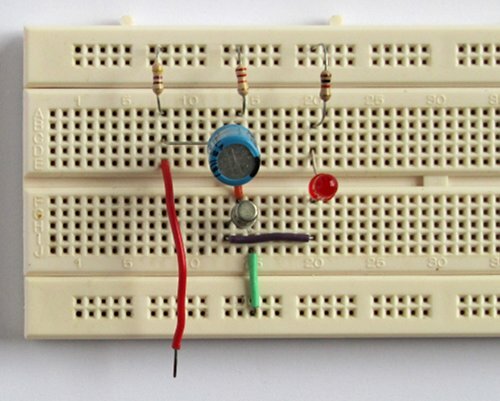 Connect the positive wire (red) of the battery to the top rail of the breadboard and the negative wire (black) to the bottom rail. Close the switch to start the timer. I.e. connect the "switch" link (red link in the photo) to the bottom rail. This will switch the LED off and start the timer. 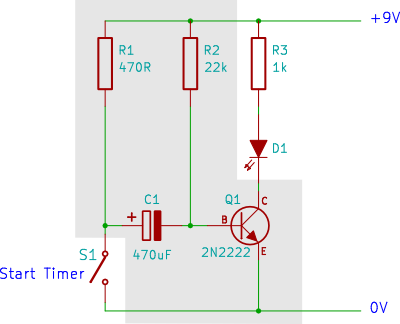 After the timer has finished timing or "timed out", the LED will switch on again. 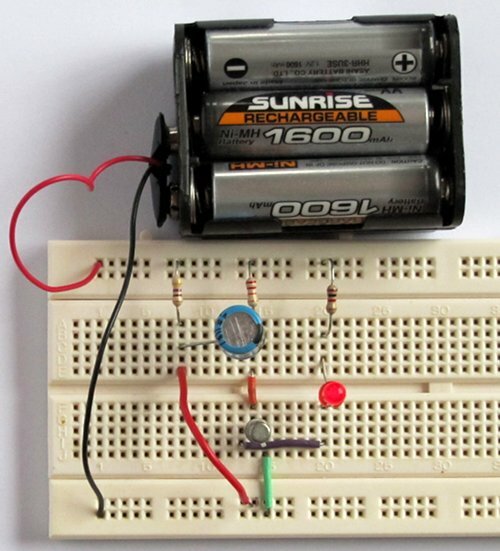 Try using a different value capacitor in the circuit to see the time period change. Using a 100uF capacitor will result in a very short time period. Using a 1000uF capacitor will result in a longer time period.